Nashville is a dog friendly city. We search the city for those events that are considered Pet Friendly and share them here. Most outdoor events are Pet Friendly however you should always check the event website to be sure your pets are welcome. Also be sure to bring water, snacks and bags to clean up after your pet. We love that Nashville is becoming more and more pet friendly. We are animal lovers and taking our dog to an outdoor concert or 5k run / walk is a blast. 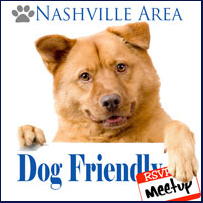 Nashville also has a number of restaurants with outdoor patios that allow dogs, and a number of dog parks where you can take your dog for great socialization.